Draped crystal accents create a tiered look for this six-light chandelier, perfect for an elegant foyer or dining room. Instantly elevate the sophistication level in a foyer or dining room with this six-light chandelier. Strands of crystal accents create a glittering shade and are gathered to evoke a tiered elegance. A satin nickel finish complements metal construction and offers a sleek, refined look. 25 3/4" high x 25 1/4" wide. Canopy is 5" wide x 3/4" high. Weighs 14.74 lbs. Comes with 6 1/4-feet of chain including one ring on each end. 14 1/4-feet of wire. Sloped ceiling adaptable. 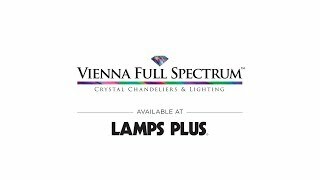 Lily six-light crystal chandelier by Vienna Full Spectrum. Satin nickel finish over metal construction. Crystal accents. Beautiful, looks more chrome than satin. Read directions carefully. One hour to install. Offering classic elegancethis contemporary crystal chandelier comes in a brushed nickel finish.